The Power of Play (Part 1). Games build a better relationship. Games are an outlet for predatory behaviours. Games can relax a stressed or anxious dog. Games can be used as powerful rewards for good behaviour. Games can be used to assist learning. Play should be part of learning and training part of play. Because games and play are such powerful bonding tools, it seems to me that allowing pups – and adult or adolescent dogs for that matter – unrestricted play could be counterproductive if you want your pup to bond with you. That doesn’t mean that dogs and pups shouldn’t be allowed to play together, but this play should be rationed, with games and play with you as the handler taking precedence. Do games need rules, and if so, why? Games with rules offer excellent training opportunities. Games with rules increase our control in arousing situations. “Control the games, control the dog”. Games with rules help to teach impulse control. Games with rules improve and maintain bite inhibition. Some interactive games you can play with your pup include tug-of-war, retrieve, hide-and-seek and scent games such as the shell game. 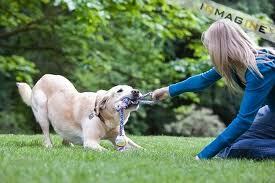 These rules are especially relevant for the games which tend to arouse the dog such as tug or retrieve. The games that require problem solving or concentration are less exciting, though no less compelling for the dog. Dog stops game on cue every time. Dog only starts the game when invited and never at other times. There should be many obedience breaks during games. If dog touches human’s skin, clothes, hair or shoes with teeth, claws, or body, game ends. Many of the dog games we teach our pups we teach backwards – in other words we teach the end part of the game first. This is so that we can stop the game quickly when necessary. Teach the “drop: when your pup is not revved. Step 1: Let your pup take an offered toy into her mouth but keep hold of the other end. As she takes it, say “Drop” and hold a tasty treat on her nose. When she lets go of the toy, click or “Good” and let her have the treat. Repeat, repeat, and repeat many times. Step 2: Once she drops the toy on cue, extend the time she is allowed to hold on to the toy. Step 3: As your pup gets better at giving the toy up you can practice when she is increasingly more aroused and also by putting gentle pressure on the toy to encourage her to tug back. Step 4: Practice the “drop” game using other toys and objects, and exchanging them with other favoured objects. Work from objects which are low on your pup’s object list to objects which are higher on the list. Note: Once you get the toy back offer up another game so that letting go does not predict ending the fun. 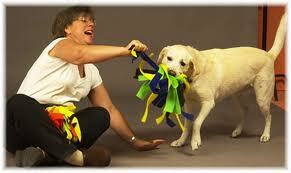 This is especially important during training: if obeying signals the end of fun we can teach the pup to not let go! Until she understands that the end of the game is not the end of the world have a stuffed Kong or rawhide chew ready to give her at the end of the game or time your exchange game just before dinner time. This cue is important so that your pup won’t make a grab for the toy when you are not ready for it. Once your pup understands the “Drop” cue you can start teaching her the “Take”. Hold the toy behind you and say “Take” as you bring the toy from behind you to offer it to your pup. Allow her to hold the toy for the length of time that you have worked up to with your “Drop” cue. Say “Drop” and take the toy when she lets go. Reward her with a treat, or the “Take”. If she lunges for the toy before you give her the “Take” cue, simply put the toy behind your back and start again. As she becomes more familiar with the two cues “Drop and “Take”, you can start adding excitement to the game. Some pups may be reluctant to take the toy because they have been scolded for taking items in the past and some because they are not sure what games are. Some under-socialized pups are afraid of interaction with people. Play is so beneficial that I feel it is important to spend time teaching your pup to play interactive games with their people.